I'm waist deep in snow today as Minnesota deals with the worst blizzard in two decades. After shoveling out our drive way, my son Mathew and I helped do the same for some neighbors. Later I took off to get some pictures of the storm and ended up out all day so that's why this drawing is hurried. 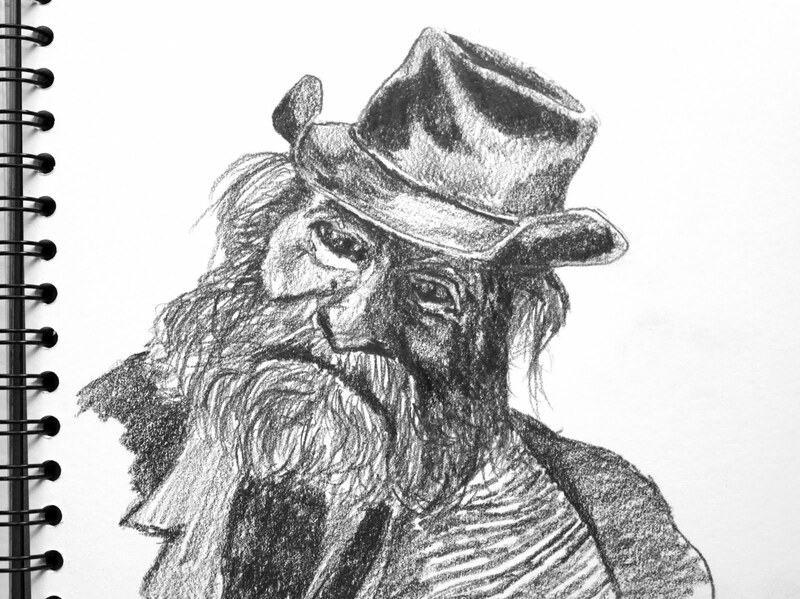 I found a photo of this old cowboy on the web and just sketched it out with a graphite pencil. Tomorrow's entry might be a bit better. I'll try to do something that reflects the weather we've been experiencing. Labels: graphite pencil, heavy paper. I agree with your FB friends; this does not look like a quick sketch. However, drawing is your passion, so your quick sketch is a masterpiece. I look forward to seeing the Minnesota snow scene paintings in your future daily art. I am proud of you for helping the neighbors. Awesome. It's a great example for your sons, too. High five!! Thank you Jayne. The truth is I had a lot of fun out in the snow yesterday and it was fantastic to see so many people helping others. Renews the spirit if you know what I mean!